Enjoy the pleasure of sleeping on pure Mulberry silk, the royal fabric of nature! Enjoyed by Hollywood stars and divas worldwide this elegant matching pillowcase and eye mask help minimize morning wrinkles and preserve your hair style (say goodbye to bed hair!) 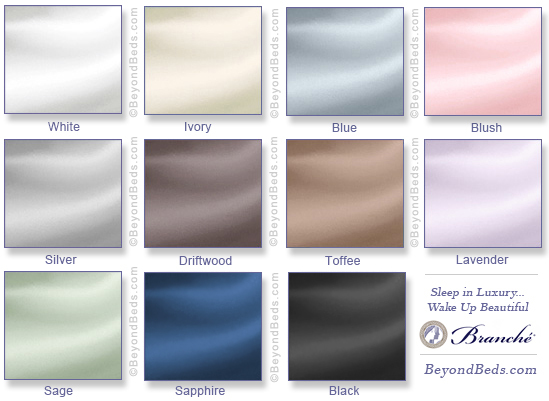 Pillowcases are available in 11 colors and 3 sizes. Silk pillowcases and eye masks are sold separately. Can Silk Really Be Good For Your Hair? The answer is yes - when it's made of deluxe quality 22 momme Mulberry silk. Similar to thread count, momme is the standard measure for silk weight. It indicates the weight of a piece of fabric 110 yards by 45 inches. For silk sheets a momme weight of 12-16 is considered good quality, with silk sheets in the range of 16-19 being very high quality - but our 22 momme Branche Silk Charmeuse Pillowcase and Eye Masque represents the peak of durability and desirability. The 18 amino acids and copper naturally found in silk help restore or preserve your hair's elasticity, luster, body, and shine. As Branche CEO and designer Donna Hinds puts it, "You'll wake up with ready-to-walk-out-the-door-hair" - so your morning routine is more of a breeze! Other eye masks are silk on one side, but this deluxe silk eye mask doesn't skimp on a stitch - it's pure baby-soft silk through and through. Wear it regularly for more refreshing sleep, minimized morning wrinkles and the sweet, soft caress of fine silk. These 22 momme 100% Mulberry silk pillowcases and eye masks are made with the highest quality silk on the market today. They are favored by celebrities and we are sure you will love them! Washing Instructions: hand or machine wash your silk pillowcase in cold water on delicate cycle, using a mild silk friendly soap. Hang dry or tumble dry on "air fluff" setting for no more than 8 minutes. Hand Wash your silk eye mask. Lay flat to dry. Silk Eye Mask, as seen in O magazine - Oprah's Favorite Things! Eye masks are black on the underside, with the exception of sage & lavender which are white on the underside.